This is the one you have been looking for! Wonderful, Move-In-Ready 4 bedroom, 2 bath home in Landmark Estates! Beautiful front door has leaded glass insert & side lights and welcomes you into the foyer – which has tile flooring, chair railing, & 2 coat closets; Formal Dining Room has laminate flooring and chair railing; Greatroom is oversized & features a gas log fireplace with built-ins on both sides, trey ceiling, & door leading to back patio; Kitchen is fully equipped with electric range, dishwasher, refrigerator, and pantry; Bright breakfast room connects with the kitchen – both have nice tile flooring; Laundry is off the kitchen & has cabinets; Master suite is HUGE! Master has trey ceiling, door leading to back patio, ensuite bathroom with 2 walk-in closets, double/split vanities, jetted garden tub and separate shower; Additional 3 bedrooms are all spacious – ALL bedrooms have brand new carpet! 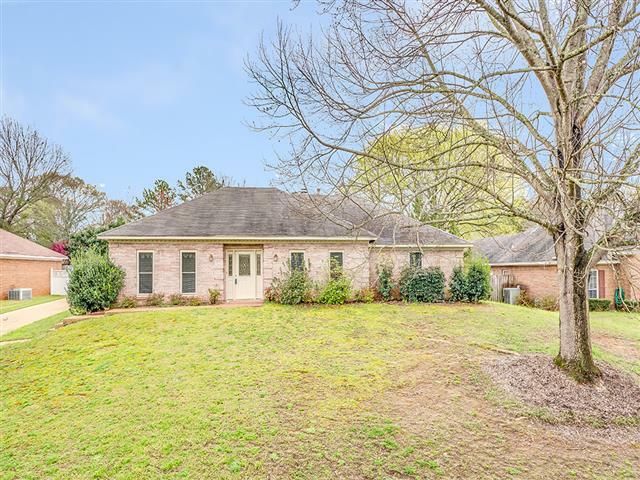 Guest bathroom has cultured marble countertop, newer faucet & framed mirror; The backyard is privacy fenced & has a brick patio & your own inground pool – just in time for Summer! 2 car carport has 2 storage rooms – 1 has been used as a workshop! Owner is offering a 1 year warranty with American Home Shield.